There are 4 Assisted Living Facilities in the Jasper area, with 3 in Jasper and 1 nearby. The average cost of assisted living in Jasper is $3,183 per month. This is lower than the national median of $3,346. Cheaper nearby regions include Petersburg with an average starting cost of $3,060. To help you with your search, browse the 1 review below for assisted living facilities in Jasper. On average, consumers rate assisted living in Jasper 3.0 out of 5 stars. Better rated regions include Petersburg with an average rating of 5.0 out of 5 stars. Caring.com has helped thousands of families find high-quality senior care. To speak with one of our Family Advisors about assisted living options and costs in Jasper, call (855) 863-8283. Jasper, Indiana is a small city with a decent-sized senior population — 17.8 percent of its 15,503 citizens are over the age of 65. Seniors have four assisted living facilities to choose from in the area, with three in Jasper and one located nearby. The Indiana Department of Health regulates care facilities in the state, and all facilities designated as ALFs are required register with the department and to obtain a license to operate. Jasper has an array of community resources for seniors, including Dubois County Children and Family Services, an agency that offers meals, legal services and financial assistance programs for residents age 60 and older, as well as a senior center. The Jasper, Indiana area is home to world-class medical facilities including Memorial Hospital and Health Care Center, in the event of medical emergencies or illness. Jasper, Indiana, located in southwestern Indiana, is known for its hot summers and cold, snowy winters. The average high temperature in January is 38 degrees Fahrenheit, and the average high temperature in July is 86 degrees. Crime in Jasper isn't nearly the overwhelming problem that it is in many other parts of the state. In fact, the Jasper crime rate is 54 percent lower than Indiana's average, which leaves it 55 percent lower than the national average. While Jasper lacks regular scheduled bus service, Ride Solution provides affordable, on-demand non-emergency transportation with advance notice, Monday through Friday. This makes it easy for seniors to run errands when needed. There are plenty of cultural opportunities in Jasper. The city has 12 sites listed on the National Register of Historic Places, including the Dubois County Courthouse. In addition, the city is home to the Jasper Arts Center, the Dubois County Museum and the Spirit of Jasper with its restored rail cars. Most of the attractions and events in Jasper offer some kind of senior discount, although the qualifying age varies. Assisted Living costs in Jasper start around $3,183 per month on average, while the nationwide average cost of assisted living is $4,000 per month, according to the latest figures from Genworth’s Cost of Care Survey. It’s important to note that assisted living rates in Jasper and the surrounding suburbs can vary widely based on factors such as location, the level of care needed, apartment size and the types of amenities offered at each community. 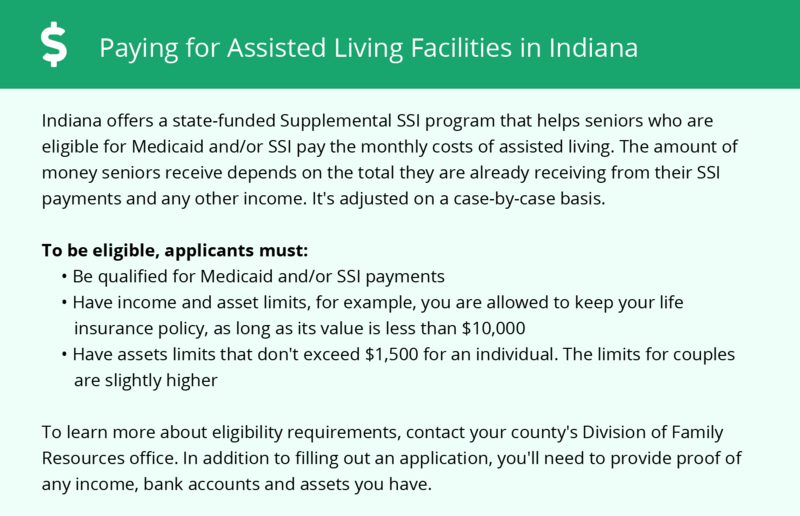 Eligible seniors who live in Jasper, Indiana can find a number of state and federal assistance programs to help with the cost of an assisted living facility. 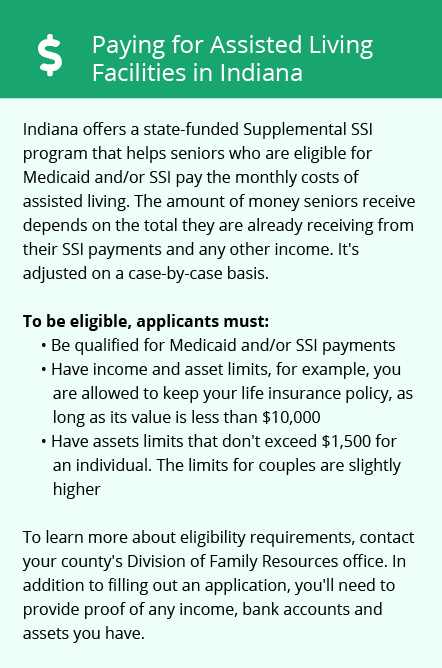 These include the Home and Community Based Services program and Supplemental Security Income Category G.
To see a list of free assisted living resources in Jasper, please visit our Assisted Living in Indiana page. Jasper-area assisted living communities must adhere to the comprehensive set of state laws and regulations that all assisted living communities in Indiana are required to follow. Visit our Assisted Living in Indiana page for more information about these laws.